London UK, 27th June 2017: Canonical, the company behind Ubuntu, today announces that its IoT OS, Ubuntu Core, is available on the Raspberry Pi Compute Module 3 – the general-purpose compute product from the Raspberry Pi Foundation. The Raspberry Pi Compute Module 3 (CM3), announced in January 2017, is a micro-version of the Raspberry Pi 3 intended to provide a simple, cost optimised single board computer. As the CM3 can be easily slotted in and out of any device with a standard, low-cost DDR2 SODIMM connector it provides an easy path for device creation, upgrading, or maintenance. Should your digital signage solution, for example, require new functionality or increased power after a period of use, upgrading its compute is now as simple as inserting a new board. The Compute Module 3 also has a more resilient storage built into the board making it a more robust compute option for industrial applications. Support for Ubuntu Core on the CM3 is another significant step towards Canonical’s vision of ‘Software Defined Everything’; a world where all devices can afford general purpose compute. By installing Ubuntu Core on the CM3, device manufacturers have an easy and cost-effective route to the production of fully-featured devices and can easily upgrade functionality through the addition of snaps – the universal Linux application packaging format. In addition, device manufacturers can develop their own app stores, all while benefiting from the additional security of Ubuntu Core. 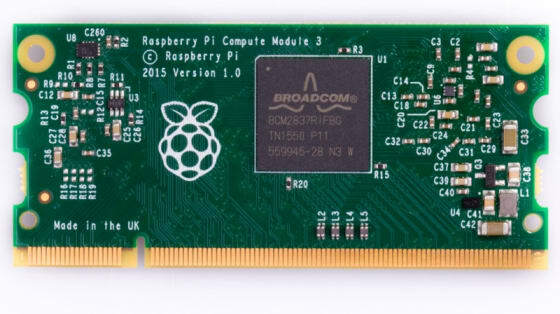 The Raspberry Pi Compute Module 3 will not only provide the basis for a number of new IoT products and connected devices, but is also highly likely to be adopted in other, already-established products currently running on more fully-featured Raspberry Pi boards, either as a means of improving existing compute or reducing costs. The CM3 features the Raspberry Pi 3’s BCM2837 processor and 1GB RAM, as well as a 4GB eMMC Flash storage device connected directly to the processor, making the memory more resilient, and omits the Wi-Fi present on the fully-featured Raspberry Pi 3. With a speed of 1.2GHz and a quad-core processor the CM3 runs at approximately 10x the speed of the Pi 1. An additional version, Compute Module 3 Lite (CM3L) brings the SD card interface to the module pins, so users have the flexibility of choosing to connect this to an eMMC or SD card of their choice.